Having your own yacht connotes status symbol. It is a measure of wealth, immense wealth as luxury yachts are extremely expensive that only the truly rich can afford. Two of the most famous luxury liners in the dawn of the 20th century were the Christina O and Savarona. These were private yachts commissioned by their respective wealthy owners. However, the emergence of luxury yacht as a fad among the world’s richest began in 1997 up to 2008. Within these span of years, the largest, the fastest and the most extravagant yachts were born. What was once a simple vessel has metamorphosed into a stunning symbol of opulence that features not just the owner’s rich culture and extraordinary persona but also his wealth and position in society. Sophisticated, elegant, lavish – these are but few adjectives that describe the 10 most expensive yachts that have ever been built in the world as of 2018. The number 10 is the $210 million Lady Moura whose owner is Nasser Al-Rashid, an affluent Saudi Arabian businessman. It was built 28 years ago by Blohm + Voss Shipyards. The extravagance of the luxurious yacht starts with its flamboyant name whose letters are made of pure gold! Yes, a 24- carat gold! But wait, there is more to this golden name than meets the eye. Lady Moura boasts a beautiful swimming pool, a folding roof, a chopper and the posh dining room table by Viscount Linley. But the most prominent feature of Lady Moura is, undoubtedly, its unique design that is distinctly Saudi Arabian. The extravagant liner whose size is 344 feet, has a hydraulic platform covered with real sand that is adjustable and can be made to park right in the waterline. It also has palm trees and deck chairs for a truly remarkable Arabian experience. Lady Moura is equipped to accommodate 30 guests with several rooms for 60 crew members. At number nine is the $250 million Al Mirqab. This luxury yacht is owned by no less than the Prime Minister and Foreign Minister of the rich, tiny Gulf State, Qatar. Hamad Bin Jaber Al- Thani had his yacht custom-made by Germany’s Peters Schiffbau Wewelsfleth. It is not only one of the world’s largest luxury liners, it was also the world’s second most beautiful in 2008 after its completion. Al-Mirqab has two VIP rooms exclusively for him. Likewise, it has ten suites, each complete with bathroom, a luxurious living room and double bedroom. It can house 24 guests. There are a total of 55 rooms for the crew members. The extravagant liner’s special features include the on-board cinema, sun deck and a helipad. It also has outdoor bars, a Jacuzzi, and of course, a swimming pool. What more, it also houses a variety of equipment for watersports. 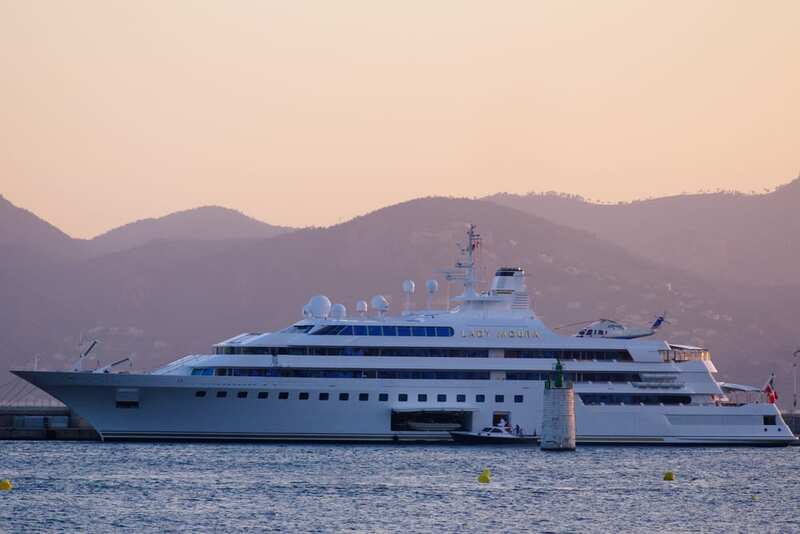 The 8th spot goes to the Dilbar superyacht, a $250 million luxury liner owned by the oligarch Alisher Usmanov of Russia. This classy liner was built by Lurssen Yachts in 2008. 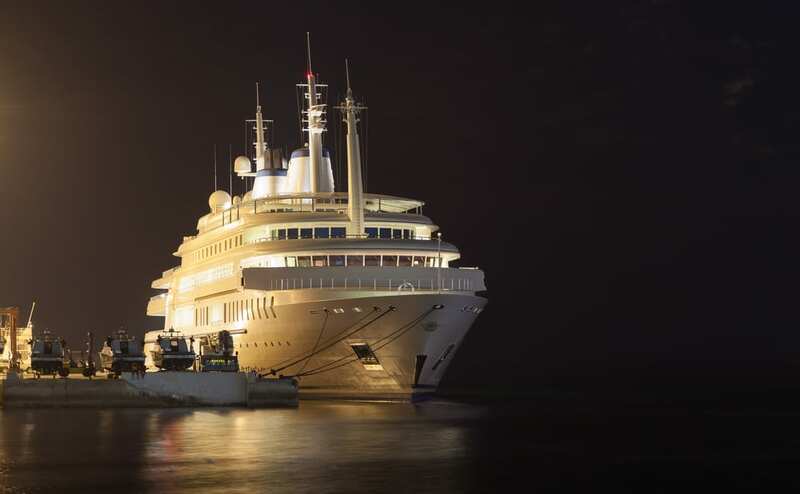 The name Dilbar is actually the oligarch’s mother. At a gigantic size of 360.89 feet, it is one of the world’s largest yachts. The luxury liner has many extravagant features, among them are the state-of-the-art spa pool and a beach club. The boat has considerable space that can have 20 guests on board with 48 crew members. At seventh spot is also one of the largest boats in the world- the $300 million worth Al Said. This extravagant yacht is owned by the Sultan of Oman, Qaboos Bin Said Al Said, from whose name is also derived from. 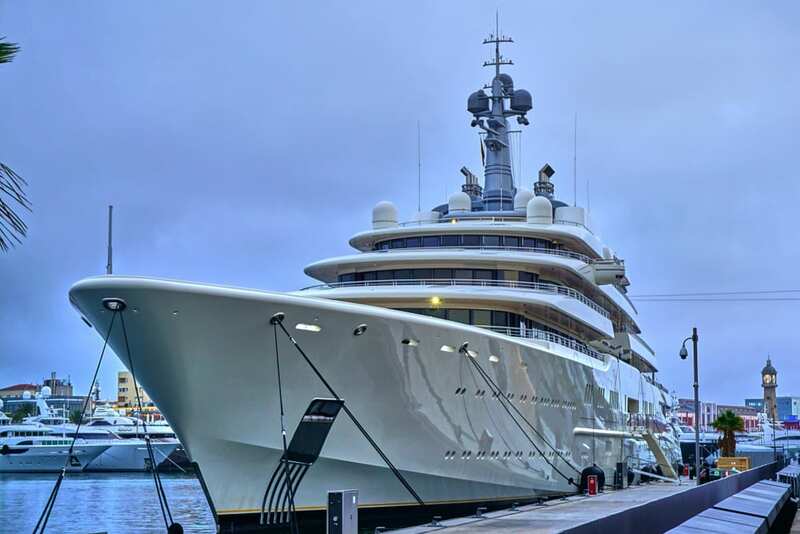 Crafted by Lurssen Yachts between 2007 and 2008, there is no enough information about the features of the superyacht although it boasts a huge concert hall that is fit to lodge a 50- piece orchestra! Being one of the largest boats in the last decade, it could cater to 70 guests and a whopping 154 crew members. 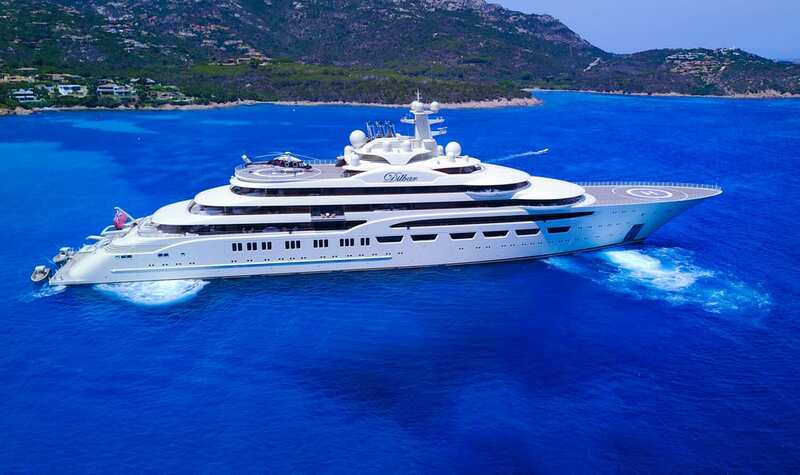 The sixth most luxurious yacht is the $323 million Motor Yacht A. 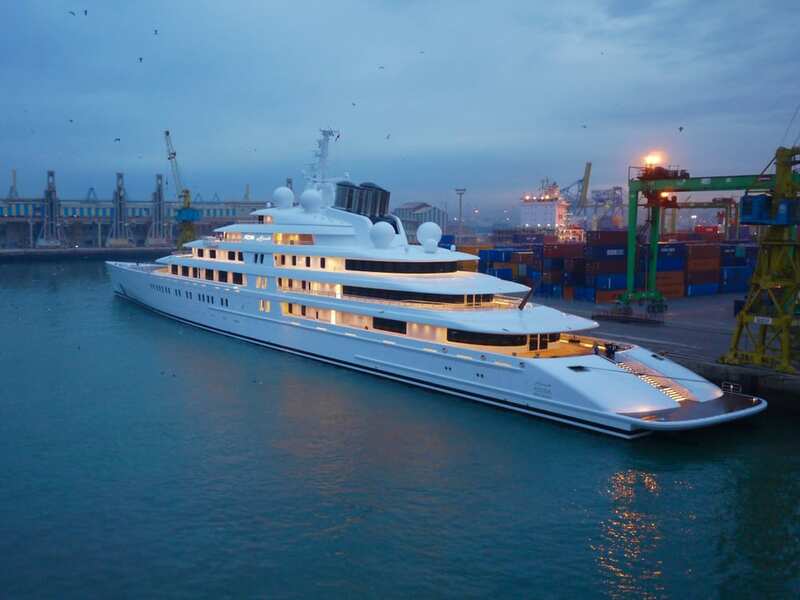 The huge superyacht that is 400-feet long evokes a design of stealth warship owned by the Russian billionaire couple Andrey and Aleksandra Melnichenko. Without doubt, Motor Yacht A is a symbol of extravagance. Made and designed by Blohm + Voss of Hamburg, it boasts a master’s bedroom and disco at a huge area of 2,500 square feet. The boat’s interior, with mirrored walls, spans 24,000 square feet, large enough to accomodate six guest suites that are convertible to staterooms. The exquisitely- designed furniture, glassware and tableware, are all crafted of French crystal. That isn’t enough of a luxury as the super yacht brags not one but three swimming pools with one having a glass bottom right above the disco. It also has a helicopter hangar and a large speed boat fixed in the hull. Likewise, it could host up to 14 guests and sufficient space to house a team of 42 crew. The name itself already repesents extravagance. This $350 million luxury liner is the fifth most expensive yacht in the world. It is owned by no less than the Emir of Dubai, His Royal Highness Sheik Mohammed Rashid al- Maaktoum. He also had the most contribution in the design of its interior. The beautiful superyacht boasts several areas for sunbathing. Jacuzzis are also everywhere. Dubai’s swimming pool is decorated with exquisite hand-made tiles. Likewise, its colorful hand-made mosaics dominate the interiors. One of the most stunning features is the circular staircase whose steps are made of glass that constantly changes color. 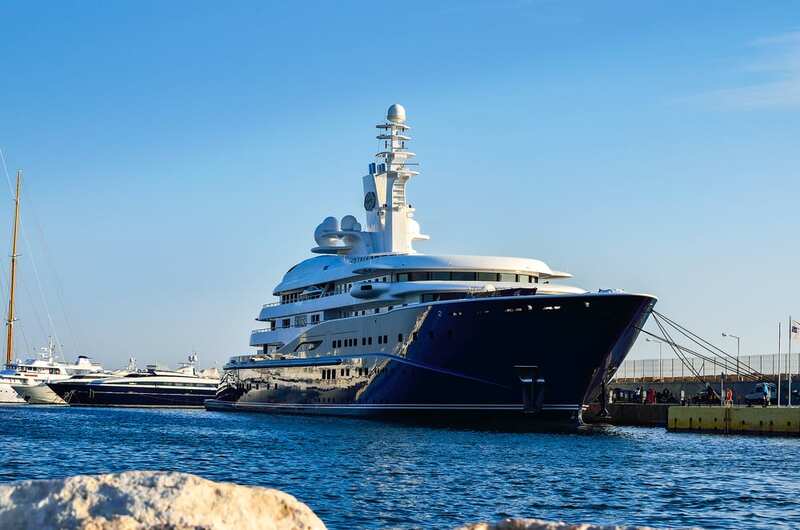 The original collaboration by two luxury yacht makers, Blohm + Voss and Lurssen, Dubai has a split-level owner’s deck with huge social halls and lounges. It has several and spacious VIP and guest suites and an equally huge space for crew members totaling to 115. Azzam, which was described by its manufacturer, Lurssen Yachts, as “the most complex and challenging yacht that has ever been built” is owned by Sheikh Khalifa bin Zayed al-Nayan, the President the United Arab Emirates who is also the Emir of Abu Dhabi, the UAE’s capital. At $650 million, Azzam is the fourth most expensive luxury liner in the world. 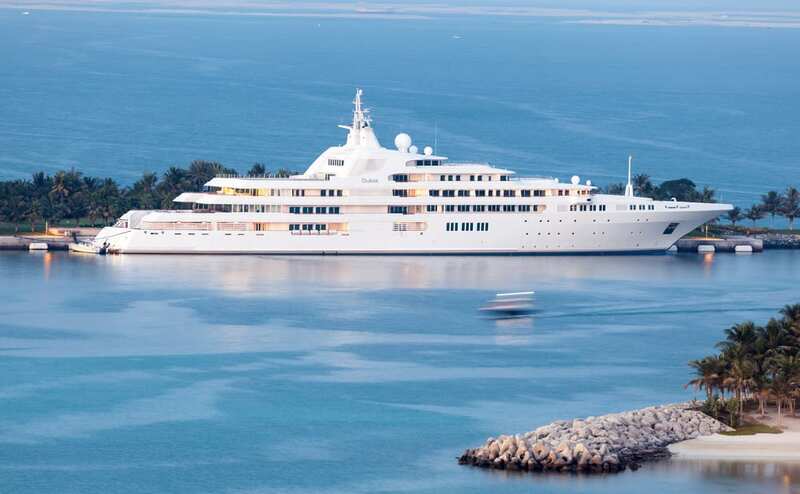 Besides, not only Azzam is pricey, it is also the largest luxury yacht in the world at 590 feet long. Therefore, UAE does not only boasts of having the tallest building in the world- the Burg Khalifa, but it also has to its name the largest yacht in the world which is Azzam. If that isn’t enough, Azzam is also said to be the fastest luxury yacht in the world at a speed of 30 knots or 35mph! It comes as no surprise that it has been the talk of the town, especially in the boating and sailing world. Though little is known about the features of Azzam, Christophe Leoni, the lavish boat’s French interior decorator gave a fitting description- sophisticated and luxurious. What about seeing a floating miniature of the beautiful Monaco cruising the Mediterranean Sea? Well, that is not impossible because the third most expensive luxury yacht in the world is the $1.1 billion Streets of Monaco. Well, it may not actually be the whole city but the street of Monte Carlo, from which it is patterned, represents all of the opulence that Monaco possesses. Everything, from Hotel de Paris and Loews Hotel to Cafe de Paris, Monte Carlo Casino and the racetrack, were replicated in this gigantic boat that spans 500 feet. Crafted by Yacht Island Design of Derbyshire Country England, the superyacht prides itself of having a tennis court and lovely swimming pools. Guests will get a feel of the sophisticated ambience of the best hotels of Monaco. The Streets of Monaco boasts of seven guest suites that has a capacity to host 16 persons. Each of these extravagant suites has its own bath and dressing rooms, reception hall and a balcony. These are all situated in the liner’s centerpiece called, the “Atrium”. It is, likewise, in this Atrium where the 30-floor posh apartment of the billionaire-owner is located. Other features of the superyacht are BBQ corners, a relaxing waterfall and a posh cafeteria with views underwater, submarines and, of course, a chopper. Russian billionaire Roman Abramovich owns the Eclipse, which is said to cost from $800,000 to $1.5 billion. It is ranked as the second most expensive yacht in the world, second only to History Supreme. Made by Blohm and Voss of Hamburg, the superyacht’s colossal size of 536 feet long is of great advantage for the boasts many advance features. One of the most unique and stunning features of the Eclipse is its built-in security system that is capable of detecting unwanted visitors, an anti-paparazzi shield that will not allow the photographers to take photos, a missile defense system and bulletproof windows. The lavish liner houses 24 guest cabins, two helipads and well, a mini-submarine, too. Eclipse’s extravagance requires 70 crew members to maintain it. Opulence is simply defined as History Supreme! At $4.5 billion, it is the world’s most expensive yacht! It may be relatively small in size at 100 feet, but it took the makers, Stuart Hughes of the UK, three years to finish. This symbol of wealth and lavishness was acquired by an unnamed wealthy businessman from the Far East, a Malaysian. The nerve-wracking price is fitting for an extravagant boat that is mostly made of gold and platinum, inside and out. The luxury liner’s base is thinly-coated with solid-gold, including the deck, the rails and staircases and, believe it or not, even the anchor! The combined weight of the precious metals used to make this pricey, luxurious superyacht totals 100,000 kg or 220,000 lbs! The most stunning and gorgeous feature of History Supreme is the superbly- designed master’s bedroom. Where on Earth could one see a genuine meteorite rock imbedded on its walls? Adding to its uniqueness is a figurine of Tyrannosaurus Rex made from the extinct animal’s real bones! To make it even more rare and inimitable is the elegantly- crafted Aquavista Panoramic Wall Aquarium. It is made of 68 kg 24-carat gold and stylishly adorns the billionaire’s suite. Not only that, diamonds also abound in the supeyacht. Brandished in the lavish bedroom is an iPhone draped in 500 cut diamonds. Beside it are two switchable pieces of the precious stone that is fitted over the phone’s “Home Button.” One is a pink 7.4-carat and the other is an 8-carat one that is said to be rare. And by the way, that is not even enough. Along with the diamond-studded iPhone is a liquor bottle that has an exceptionally rare 18.5- carat diamond with a price tag of $54 million! It is indeed Supreme in all its ways. Truly, one that is already written in history. The construction of all of these wonderful yachts require an enormous amount of marine plastic fabrication as well as custom plastic tanks like those manufactured by Industrial Plastics in Brisbane, Australia.